Orla Kiely has joined Japenese retailer UNIQLO for a collaboration. UNIQLO are proud to announce their third collaboration with Irish designer Orla Kiely for the fall winter season. After the sell out success of the last two collections, Orla’s bold colourful prints will once again feature on an exclusive collection of women’s HEATTECH v-neck and rollneck t-shirts. The HEATTECH range is incredible and has been a saviour for me over the past few super-cold winters, successfully combining style and practicality. The collection unites classic British design with Japanese quality and innovative fabrics. The collection features eight different designs in 16 colourways across v-neck and rollneck long sleeve t-shirts. All designs will launch exclusively online on Monday 28 October, then in all UNIQLO stores on Thursday 31 October. I cannot wait to get mine, as the temperature drops I’m seriously in need of some thermals. 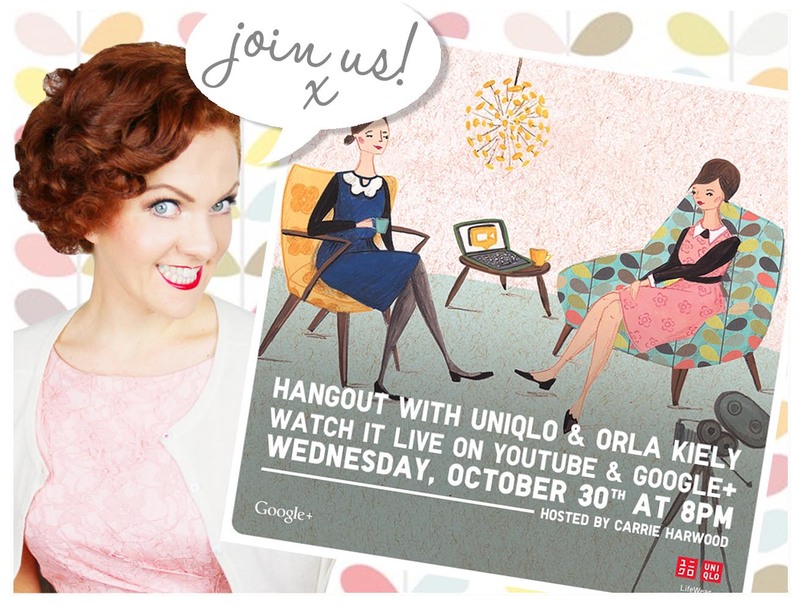 I’m so excited to get the opportunity to ask Orla a question and hangout with the fabulous ladies for a live chat. As a Google+ novice, I’m praying there’s no technical hitches from my side (!) >YELP< and that you’ll all be able to understand my thick Yorkshire accent! and enjoy seeing my manic grin live on camera.